The bloodline of North Korea's founder Kim Il-sung, his son Jong-il and grandson Jong-un is apparent. Kim Jong-il is the father of North Korean leader Kim Jong-un and his sister Yo-jong― but lesser known is their mother. Jong-un, Yo-jong and their older brother Jong-chul were born to Ko Yong-hui. Ko was a former dancer born to a South Korean immigrant in Japan. She is known to have been the de facto first lady of Kim Jong-il for some time. For the 28 years she lived with Kim Jong-il, she was kept out of public view. She is known to have died while receiving treatment for cancer in France in 2004, and in an undisclosed procedure her body was taken back to Pyongyang. Kim Jong-un's wife Ri Sol-ju, however, entered public view when the leader took power in 2011 following the death of his father. Her role had been limited until recently. Last week, she attended a major state event in Pyongyang without her husband for the first time. Ri, along with senior officials, watched a ballet performance by a Chinese troupe. She addressed Chinese officials as would the state leader, and sat in what would have been Kim's seat, next to Song Tao, the Chinese official who led the cultural delegation. Meanwhile, North Korea's state news agency for the first time referred to Ri as "respected madam," using the term referring to a first lady for the first time in 45 years, when it was used to address the wife of Kim Il-sung. This is an elevation from the "madam" Ri was referred to in the Korean Central News Agency's report of the regime's annual military parade held on Feb. 8. Before then, Ri was referred to as "comrade." Ri debuted as first lady on the international stage when Kim made his first overseas diplomatic mission to Beijing to meet Chinese President Xi Jinping. Ri also accompanied her husband at a dinner hosted for South Korean envoys who visited Pyongyang last month. This shows a contrast from the spouses of Kim's father and grandfather, who hardly made public appearances. "The regime's provision of a greater role to Ri is meant for North Korea to appear as a normal state in diplomacy," said An Chan-il, head of the World Institute for North Korea Studies. "Meanwhile, internally, this could be seen as a means to consolidate North Korea as a family state. The regime has had its fathers ― Kim Il-sung, and his son Jong-il and grandson Jong-un ― but the motherly figure has been missing. "Providing an increasing role to Ri could also be a means for North Korea's women to unite, and show loyalty to her." Attention is growing over whether Ri will accompany Kim for the third inter-Korean summit to be held on Friday at the truce village of Panmunjeom. In the first and second summits between Kim's father Kim Jong-il and former South Korean presidents Kim Dae-jung and Roh Moo-hyun in 2000 and 2007, only the first ladies of the South attended. If Ri attends the summit, a meeting between the first ladies could be held on the sidelines. Kim Yo-jong's role also appears to be growing. During the PyeongChang Winter Olympics in South Korea, she stole the spotlight as she graced the front pages of news outlets here. The younger sister of the regime's dictator visited as part of the North's Olympic delegation, becoming the first member of the Kim dynasty to set foot in the South. While North Korea's nominal head of state Kim Yong-nam led the delegation, Yo-jong was here as her brother's special envoy. 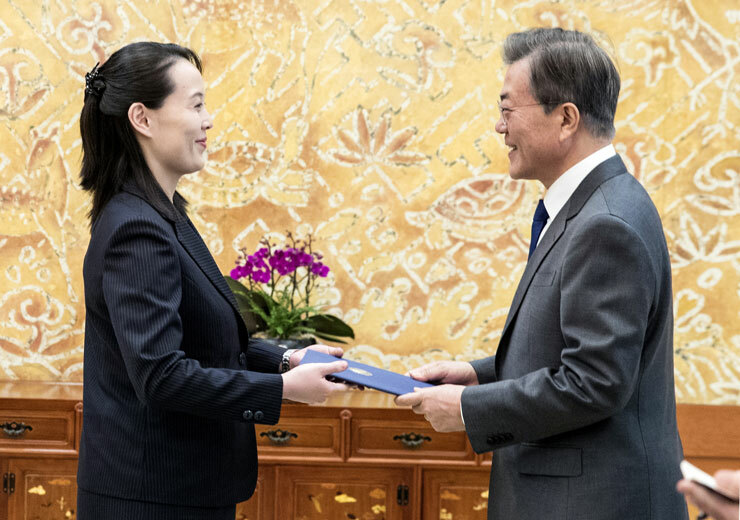 She delivered a handwritten letter from the state leader to South Korean President Moon Jae-in to invite him for talks _ which led to the arrangement of the inter-Korean summit. Yo-jong, a member of the ruling Workers' Party's political bureau, has been noted as a trusted adviser to her brother. It was her first appearance on the international stage. When she returned to Pyongyang, she received a grand welcome from senior officials and a military band. When the Chinese performance troupe came to Pyongyang, the state newspaper reported the state leader's sister visited the head of the delegation, Song, at the delegation's hotel for a confabulation. The meeting took place without her brother. Yo-jong is compared to her aunt Kim Kyong-hui, the sister of her father Kim Jong-il. Jong-il and Kyong-hui's collaboration was referred to as "sibling politics," to which Jong-un and Yo-jong's relationship has been likened. However, Kim Kyong-hui is regarded to have been a symbolic figure who was not involved in diplomacy or decision-making in state policies. She accompanied her brother and state leader Kim Jong-il to internal events. Kim Yo-jong became the youngest member of the Workers' Party's powerful political bureau at age 30 last October. Her aunt assumed her position in the party in her 60s. "Kim Kyong-hui only lived in the shadows of her brother ― Yo-jong and her aunt's roles are totally different," An said. North Korea, which has up until very recently been known as a reclusive state, appears to be attempting to alter its image, and Yo-jong is seen as playing a central role in this effort. "Kim Yo-jong is playing a key role as Pyongyang opens up and aims to join the international community," the researcher said.